Today’s podcast features a fascinating conversation I had with New York Times graphic journalists, Andrew DeVigal and Steve Duenes. Andrew and Steve are part of the team responsible for taking data and raw information from the day’s news and turning it into highly interactive and informative online experiences. Today’s podcast features a fascinating conversation I had with New York Times graphic journalists, Andrew DeVigal and Steve Duenes. Andrew and Steve are part of the team responsible for taking data and raw information from the day's news and turning it into highly interactive and informative online experiences. 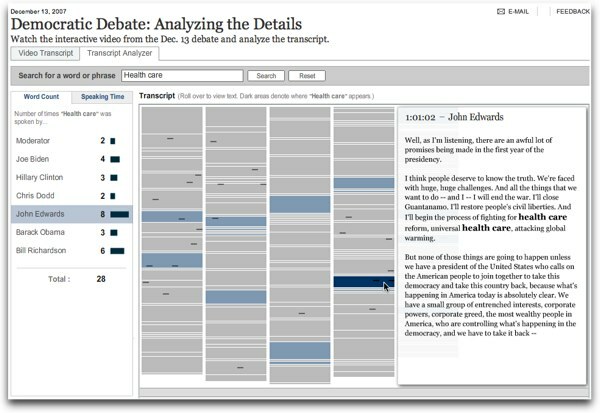 For example, the team built the NYTimes Debate Analyzer, a tool to explore the presidential debates. Readers can see how frequently a specific term, such as "health care" or "iraq", is mentioned by each candidate. They can scroll to a specific answer in the transcript and the video automatically plays that section, bringing an entire new way to experience the debates. I think you'll enjoy my conversation with Steve and Andrew. You'll learn a great deal about the their journalistic techniques for building for successful interactive online experiences.